Gluten Free Fruit Recipes! 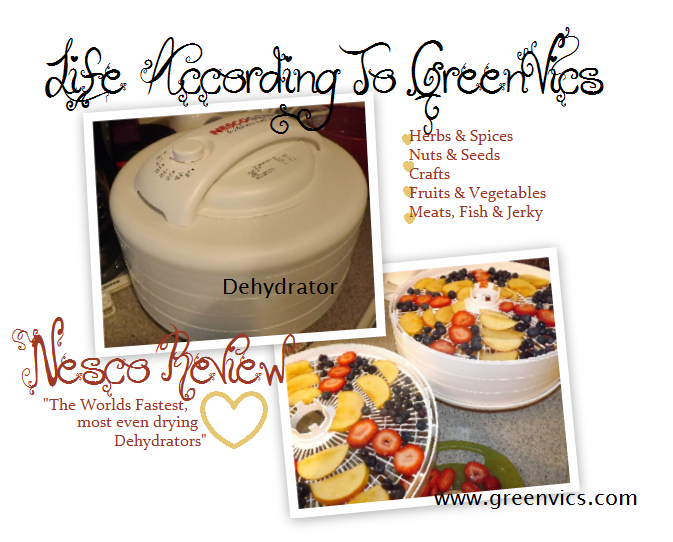 Win A Nesco Electric Dehydrator & Jerky Maker. The Nesco/All American Dehydrator is probably one of the easiest appliances I have ever used. If you are a health food guru, or just a beginner, it's all the same. Any one can use this machine. All I did was open the box, removed the dehydrator, and cleaned the four separate trays off. Next came the fun part, I started to prepare my fruits. If you have younger kids, or even school aged kids, this dehydrator would make the perfect back to school snacks. Even on the run, and out the door for breakfast. Jerky for protein, and Fruits like apples that's full of fiber would be healthy & filling. Along with blueberries, and strawberries that are full of vitamins they can easily eat with no mess would be ideal too. Any fruit you like, you can dry! It is also a Jerky Maker, and came with packs of seasoning for that as well. I plan on making chicken, and turkey beef sticks. Maybe even some turkey ones after Thanksgiving with leftovers. Be prepared to see more posts of me creating awesome things with this machine. I'm using it to make dried snacks for my 19 month old, He refuses to eat "wet" foods, so I get his vitamins in by dried fruits. When dried properly fruits can have a great source of Vitamin A & C, along with the daily fiber for a healthy body. This is my first time using a dehydrator, so I am just a beginner. 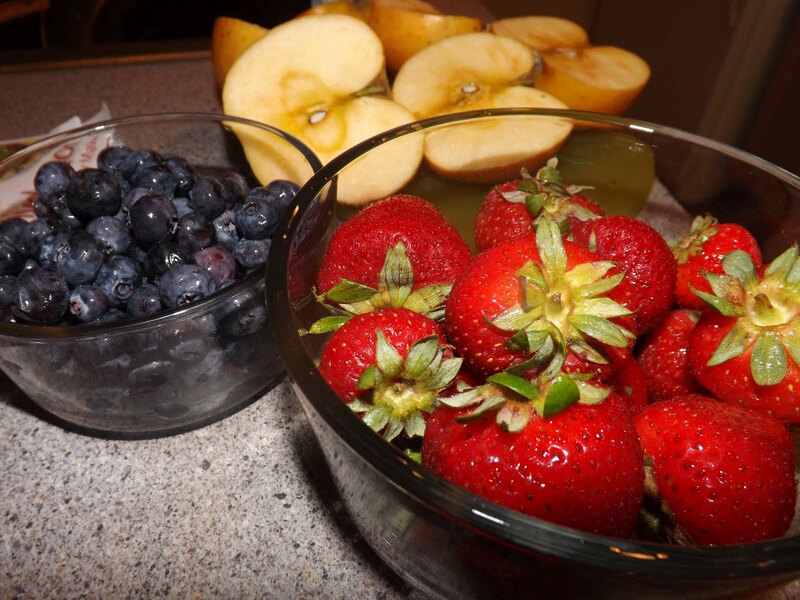 I prepared Strawberries, Blueberries, & Fiji Apples. After washing them off. The Strawberries, and Apples(I soaked in water with Cinnamon) were sliced thin. They are not to overlap while on the dehydrator trays. The blueberries I just placed on whole, where ever, I did try to make it look pretty. 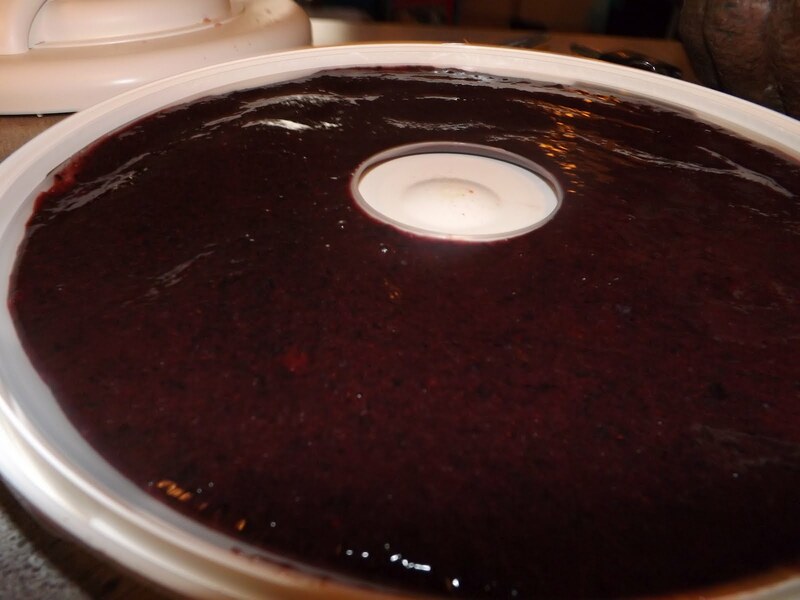 I also puree'd blueberries in the blender to make my own blueberry fruit leather. I buy fruit leather all the time, and have never made my own. This is more so for me, than the kids! You don't even have to use sugar in it, the fruit has it's own natural sugar. If the fruits you use are tart, consider using Honey. I love BeeFree Honey (apple honey.) This kit came with a make your own fruit roll up plastic tray with a special no spill over lip. Over all it takes about 10-12 hours for the fruits I chose. What is also great about this machine is that the top tells you what temperature to use to dry certain things. There is also a recipe book with easy to follow ideas, like, Orange Julius, Strawberry Cream Cheese, and Pina Colada Fruit Roll Ups. 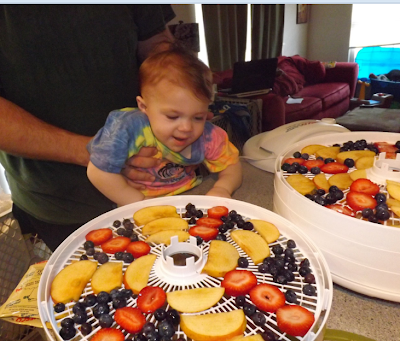 This was a fun review, If you know how to slice fruit, YOU CAN make your own dried fruit. 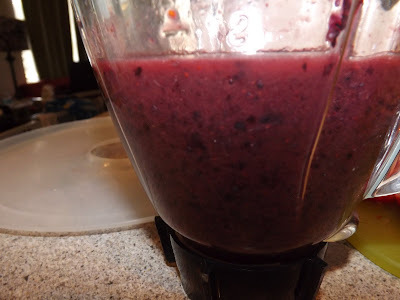 If you know how to push "puree" on your blender. YOU CAN make your own fruit leather. Don't be afraid to try something new. My Blueberry Fruit Leather!!!! Turned out great!!!! I used just blueberry puree I made, added a drop of BeeFree Honey (Apple Honey) for extra sweetness. It would've been good without the honey too, but I love things sweet. My Strawberry Chips!!!!! They dried faster than the rest, but I love them crunchy, so I left them in longer. My Cinnamon Apple Chips!!!!! The aroma that came off of these while they dehydrated was just beautiful. I like my Apple Chips with the skin on. These are so delicious. These are the Goodies I dehydrated over night, and woke up too. The whole blueberries take a little longer, so I've puree'd some strawberries to make strawberry fruit leather with since I have extra trays available again. I really love the fruit leather. I'm going to make my own Pumpkin Pie leather, Apple pie leather.. Peach cobbler leather.. I seriously, am addicted to the fruit leather. The machine itself is 500 watts, top mounted 2,100-rpm fan. That means it dries faster with more power, and you get results in hours, not days. The patented Converga-Flow action provides even heat distribution, no need to rotate trays. No worries about flavors mixing. Adjustable thermostat (95F-155F) used for Precision drying for the best quality for perfect fruit, vegetables, herbs, and jerky. Opaque Vita-Save exterior for exclusive light-blocking in preserving vitamins, and minerals. Expandable, even tho it comes with 4 trays, This model can operate with 12 trays, and automatically adjusts the pressure itself. 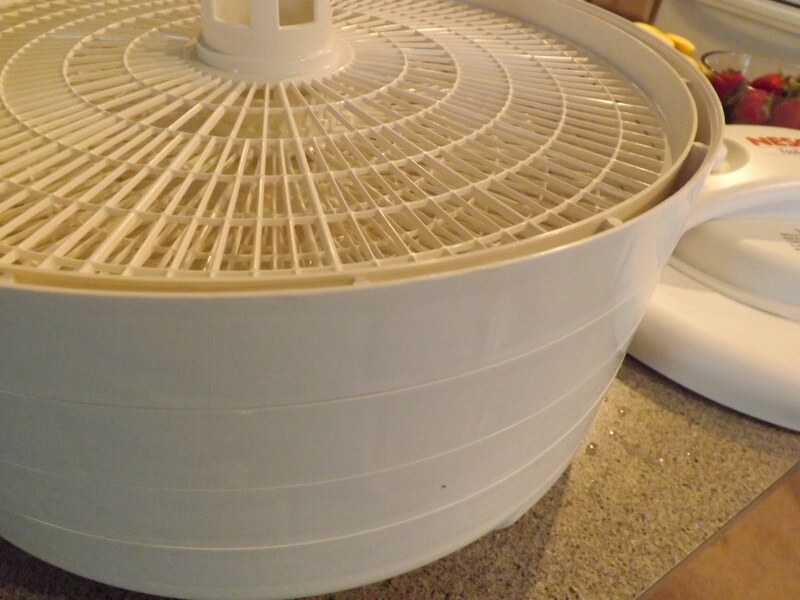 Here's your chance to Win A Dehydrator!! I want to thank Nesco/All American Harvest for such a wonderful, easy to use machine. And, also a bigger thanks for Sponsoring this Review, & Giveaway. Thank you Nesco!!!! I am in love with my dehydrator. 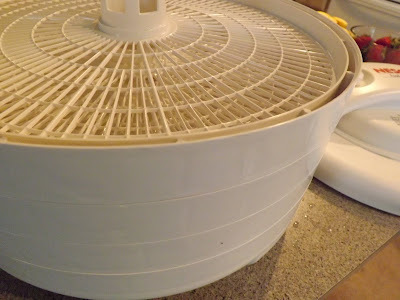 **Receiving the Dehydrator for free from Nesco did not sway my opinion on dried fruit. I have always loved dried fruit, and been curious on how to make my own. Honestly, If It wasn't good, I would have said so. I've had nothing but a positive experience using this machine. Links posted are up to the reader to click in reference to more information on the machine. **..More About My Blog Disclosure.